LOS ANGELES – Mother Nature’s hurricane season might be winding down but come Oct. 26 a storm of boaters will be trekking the Pacific Ocean from San Diego to Cabo San Lucas as part of the annual Baja Ha-Ha cruiser rally. In the middle of the boating storm will be John Berg, who will be sailing his boat, Valhalla. Berg, a Laguna Beach native, will go about his trip to the southern point of the Baja California peninsula just like everyone else on the 750-mile journey. However, Berg is 100 percent blind. Suffering from retinitis pigmentosa, or RP, he has lived almost as much life with eyesight as without, going fully blind between the ages of 25 and 28. Now, the 54-year-old lives his life aboard the recently purchased vessel, Valhalla. Almost immediately after purchasing the boat, Berg docked at Lighthouse Yacht Landing in Wilmington. He lost his previous vessel, a Nordic 40, which he called home for 12 years, off the coast of Hawaii a few months ago. He purchased the Ericson 34 on Sept. 29. After spending a few months bouncing around from house to house, living with his mother or friends in the Ventura area, Berg now calls Valhalla home. He is ready to take her to Mexico for the winter. “I was pretty impressed with it because it had pretty much all the gear that I felt I need to go cruising again without having to invest all the time and effort that I did on the previous boat,” Berg said. Though still emotional about the loss of his Nordic 40, sailing is what gives Berg life. Thanks to sailing, he is able to make the most of living with RP. Being fully blind, Berg noted, limits his ability to do certain things. 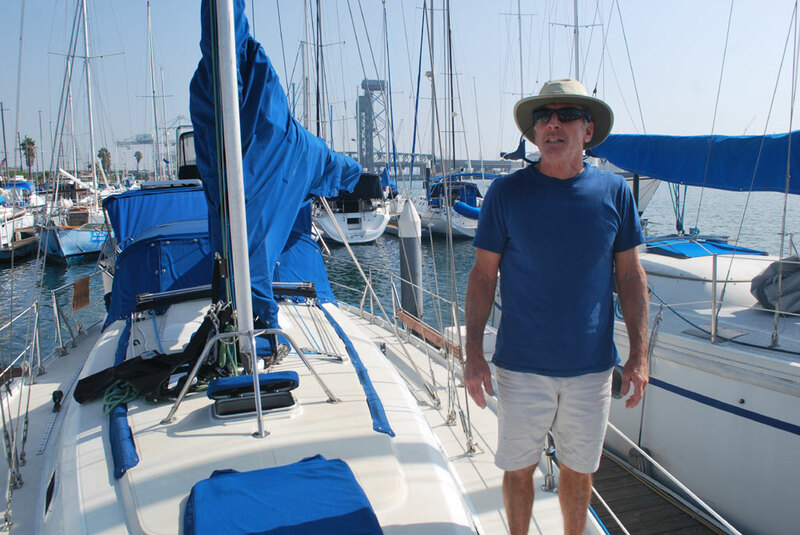 Though he aspired to be a physical therapist during his days attending Northern Arizona University, Berg ultimately realized sailing was the one thing he could do where his blindness would not impair him. Riding and working on motorcycles as a teenager, Berg said he has a mind for all things mechanical. Such a mind does not always need eyesight, as Berg always found something to do on his vessel. Though the occasional task does require some help, most work he performs on his own. Recently, Berg installed new radar atop the vessel, doing most of the work himself. The only help he needed was with the electrical wiring, recruiting someone to help him make sure he did not place a red wire in the wrong place. Beyond the radar, Berg said most of Valhalla, which will be the second boat he cruises from San Diego to Cabo, is ready for sailing the open ocean. The boat cruised to Mexico with her previous owner in 2012, meaning Valhalla came equipped with requisite safety gear, radio equipment, working sails, cockpit shading, anchors and life boat, which meant less time having to prepare the boat for the Baja Ha-Ha. Comparatively, he spent months preparing his Nordic 40 with the standard equipment for last year’s Baja Ha-Ha. Also sail-ready is Berg, courtesy of a special navigation and charter monitor. It was the only “accommodation” aboard his vessel. The monitor uses what Berg described as a “WiFi multiplexer” to broadcast all navigational data to him through an iPhone app. With the monitor and cell phone app, Berg is able to hear key information such as wind, speed, depth and other data to help him navigate. While he rotates sailing responsibilities with his crew members, the monitor and phone app aid his ability to sail despite being blind. On short trips to Dana Point or San Diego, he has just one crew member aboard, while longer trips call for three crew members. He will have a crew of three aboard Valhalla during the Baja Ha-Ha. He fondly reminisces of his first Baja Ha-Ha, meeting people and making new friends en route to Cabo last October. Consistent with the theme of Baja Ha-Ha, Berg participates in the rally to make new friends and take on the challenge of sailing from the southwestern corner of the United States to the southern tip of Baja California. “I had a good time. I put a lot of time and effort into my boat … [and] spent a lot of time preparing it. Everything went great. I had a great crew,” said Berg who spent about four months navigating to La Paz, Mazatlan and La Cruz after the rally. Berg is looking forward to his venture along the western Mexico coastline in his Ericson 34. A crew member with him during last year’s Baja Ha-Ha will team up with Berg again this year. Also joining him is a lady who served as a crew member during Berg’s first ocean crossing to Hawaii in May. This year, the Baja Ha-Ha kicks off Oct. 26 and continues through Nov. 8. A cruiser rally, Baja Ha-Ha is not a race and no prizes are awarded for those who arrive at Cabo ahead of the pack. Everyone who arrives in Cabo via Turtle Bay and Bahia Santa Maria receives a trophy. It will be awhile before Berg returns to Southern California since he plans to head a little further south after completing the Baja Ha-Ha to La Cruz, a fishing village just north of Puerto Vallarta. Once back in California, Berg plans to dock at a marina where he can walk to a local grocery store. A marina in Long Beach could be a possible destination, Berg said. There are slips in San Diego conveniently located to everyday services as well, he noted. Once the winter is complete, Berg hopes to take Valhalla further out in the Pacific Ocean. “If I come across the right situation and right crew, I might consider going to the South Pacific,” Berg said. In love with sailing since aboard his first catamaran at age 13, Berg spent a lot of time cruising around Newport Beach. Moving up to Lake Tahoe after high school to operate a bicycle shop, Berg soon returned to Southern California’s coastline in San Diego. Meeting a special someone down there while taking classes at a community college, Berg would go on to finish college, get married and become a father. His wife passed away in 2009. Now a single dad, Berg guided his daughter through high school. Upon graduating in 2013, she enrolled at the University of San Francisco the following fall semester. Though he is a fan of backpacking, hiking, paddle boarding and water skiing, Berg has taken to sailing because it allows him to live life. “I have to have something to do, and there is always something to do on a boat. I can go up my mast and do basic things. I feel like I have a purpose. In the whole boating community, it’s a pretty tight-knit community,” Berg said, adding he would feel “isolated” without sailing. “I’m sure I could find some other hobby, possibly, and find something similar, do some other form of activity, but I go out on the water and it works for me,” Berg added.